The local tourism literature aptly describes Phu Manorom as “one of the province’s major places for relaxation”. Browse places to stay in Mukdahan on Agoda.com. Free cancellation. One part temple and two parts park, it’s located atop a small mountain that affords great views down over the Mekong and into Laos. Often occupied by young locals who munch on som tam and swig beers in the afternoons, several pavilions are set up along the breezy ridge for enjoying the views in comfort. At time of writing, the adjacent Wat Phu Manorom was almost finished building a gargantuan concrete seated Buddha image that’s easily visible from Savannakhet. Phu Manorom probably isn’t worth a trip by itself unless you’re planning a picnic or need to reach a higher altitude on a really hot day, but it makes a fine addition to a trip to Phu Pha Thoep National Park. 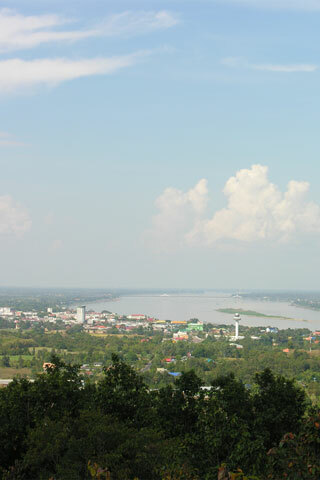 It’s only five kilometres south of Mukdahan and can be easily reached by hired bicycle. Early morning when the sun is rising is particularly pleasant. To get here, head south on Samut Sakdarak Road, take the first U-turn after Mukdahan Tower then the first left, which will take you right up to Phu Manorom after a couple of kilometres. A tuk tuk can also take you here and back for around 200 baht.